To house the school’s expanding book collection, Davidson College moved from the Carnegie Library to the Hugh A. and Jane Parks Grey Memorial Library in the fall of 1941. Captain James Park Grey ’85 anonymously donated $150,000 for the construction of a new library in 1940 (McKnight). 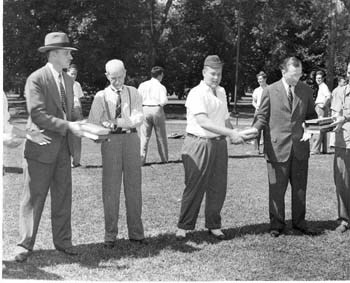 When his donation was revealed in 1941, Captain Grey declined having his name placed on the building and passed the honor to his parents, Hugh A and Jane Parks Grey. The couple had sent all five of their sons to the college and were an “influential exponent of higher education” (Davidsoniana). Captain Grey highlighted this quality in his donation, as he desired both to “fulfill a need of the college and perpetuate the memory of his parents” (Davidsoniana). Grey’s total gifts to the college are valued at $225,000, financing (in addition to the library) a professorship, a loan fund endowment, and an x-ray machine (Jackson). 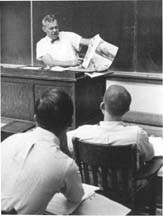 Grey assisted the college in many of its endeavors during his lifetime. Before the Grey Library could open, the Davidson College community needed to transport books from the outdated Carnegie Library to the new building. Instead of using vans to transport the materials (a more typical way to transport books locally), the college used a more unique method. On October 9, 1941, the school required all students, faculty, and staff to form a line from the steps of Carnegie to the stacks of Grey. Professors were encouraged to stand next to their “pet students” (Davidsoniana). (The community passed the books one by one until the entire 45,000-volume collection was transferred to the new building (Davidson College Catalog). This task, though long and difficult to orchestrate, served as a memorable opening for Grey Library and all who were involved. The move to the new library coincided with a shift in directorship. Dr. Chalmers Davidson replaced Cornelia Shaw as the head of the library, and arrived with a library degree and a doctorate (Chalmers Davidson, Davidson Encyclopedia). Throughout his long career (1936-1976), he played an active role in Grey’s collection, finances, and upkeep (Chalmers Davidson, Davidson Encyclopedia). In his tenure as Library Director, Davidson strove to increase the library’s budget and longed for a collection that selected the college’s high academic standards and could compare to libraries of competitive colleges. Dr. Davidson wrote several letters to President Martin to request more funding and increased staffing, pleas that the administration often granted (Davidson, Letter to President Martin). It is also evident from the vast amount of notes that the head librarian also worked to record and compile the ongoing changes to the library throughout his tenure . The other full-time staff members of the library possessed similar credentials and passions. In 1947, the library staff included four female staff members, each of whom held a library degree. This number jumped to seven employees (five with degrees) by 1962 (Davidson College Catalog). An arsenal of student staff members, up to twenty per year, assisted the full time employees with constant dedication to the library. Three major goals outlined the mission of Grey library: “appropriateness for study by students, usefulness for research of faculty, and fitness for recreational reading” (Davidson College Catalog). These ideals helped shape the ever-expanding collection and the community standards of Davidson. Students and faculty helped to select new books for Grey, emphasizing the growing standards of Davidson. Students and faculty helped to select new books for Grey, emphasizing the growing communal input of the campus library. The capacity of the library steadily increased over the years, starting at a mere 45,000 books, and increasing to 175,000 by 1974. Gray Library placed a large importance on periodicals, and subscribed to 200 magazines and journals. In addition, the staff ordered newspapers from every state with a substantial student population, which demonstrates the high priority placed on student needs. The 1941 Library Report stated that the collection contained a strong section of worlds by U.S. President (and former student) Woodrow Wilson, Mecklenburg County documents, and information from the Southern Presbyterian Church (Davidson College Catalog). These resources were unique to Grey Library, and they presumably raised its importance in the local and greater North Carolina communities. The library also contained topic-specific rooms, such as a periodical and reference room and the Rare Books Room. 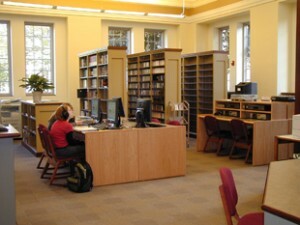 A unique space (a similar room can be found in the current little library), called the Davidsoniana Room, held a copy of every publication authored by and written about college alumni. No matter its strong points, the collection was far from perfect. Dr. Davidson recognized that the library lacked works in “The Essays and General Literature Index”, as well as in “The Poetry Index” (Davidson, Library Library Director’s Treasurer Report). The library continued to grow, but eventually was unable to contain its ever-expanding collection. 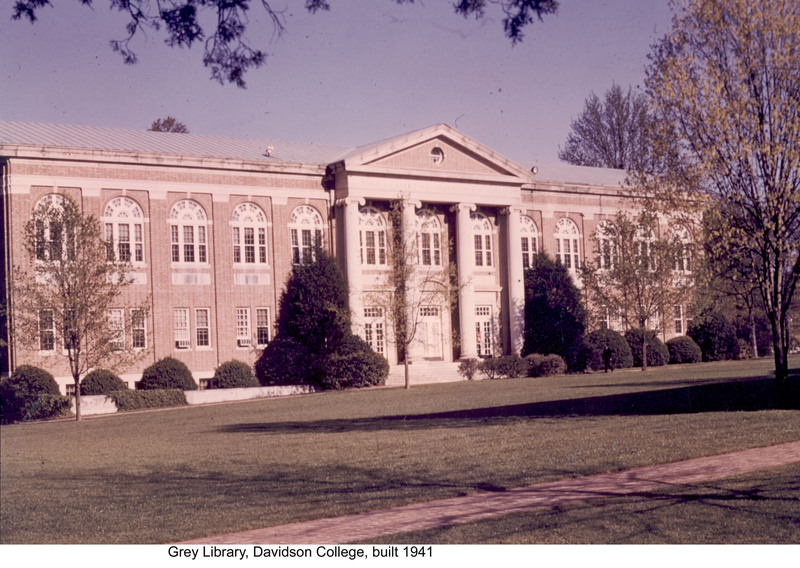 In 1958, Davidson officials decided to add a new wing to Grey in response to this problem and to provide more modern amenities for students. The new addition, named The Babcock Wing in honor of Mary Reynolds Babcock (www.mrbf.org), doubled the space of the library, and created room for 100,000 volumes. In 1974, however, Grey reached its limit of 175,000 books (“The New E.H. Little Library”), prompting the move to the Little Library later that year. Grey Library was designed to satisfy the needs of its patrons, whether students or faculty. According to a 1970 floor plan sketched by Mr. Russell A. Strong, Director of College Relations, the library held four expansive and diverse levels (Strong). The ground floor focused on student and faculty research, as the floor plan highlighted the card catalogue, reference desk, and numerous librarians’ offices (Strong). These resources were useful to all students (especially those who needed to complete academic work) and demonstrated Grey’s mission of catering to the academic Davidsonian. 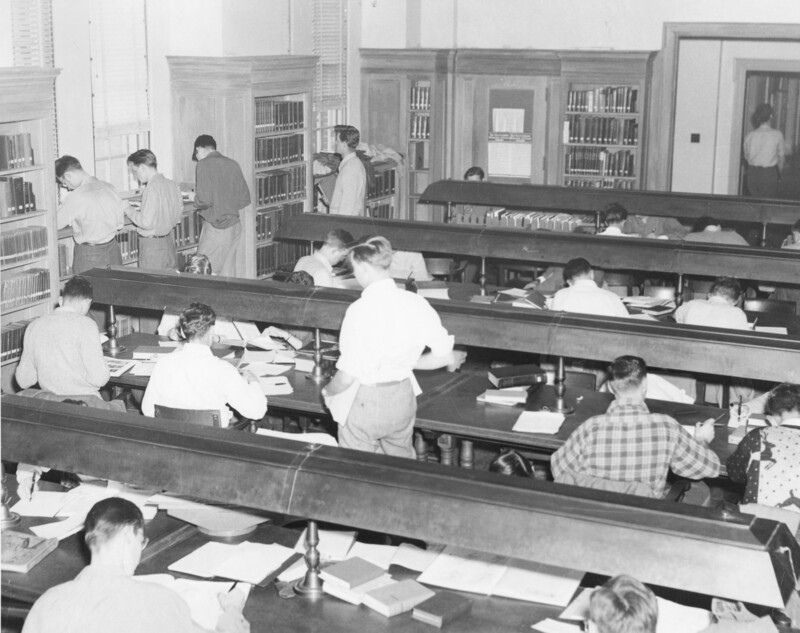 The second and third floors were filled with standard stacks of the library’s collection for browsing and research as well as individual study carrels, giving the students a quiet environment in which too work. At the same time, the library also served students who desired to read for pleasure; a large smoking room filled with periodicals and newspapers in the basement ensured that the library attracted the student need for relaxed reading (Strong). The Grey Library was constantly growing due to patron usage and increasing book capacity. The circulation of books within the library spiked dramatically throughout the duration of its use. During the 1940-1941 the number transactions was 13,535. This increased to 31,897 in 1960-1961 and up to 48,575 in 1970-1971. 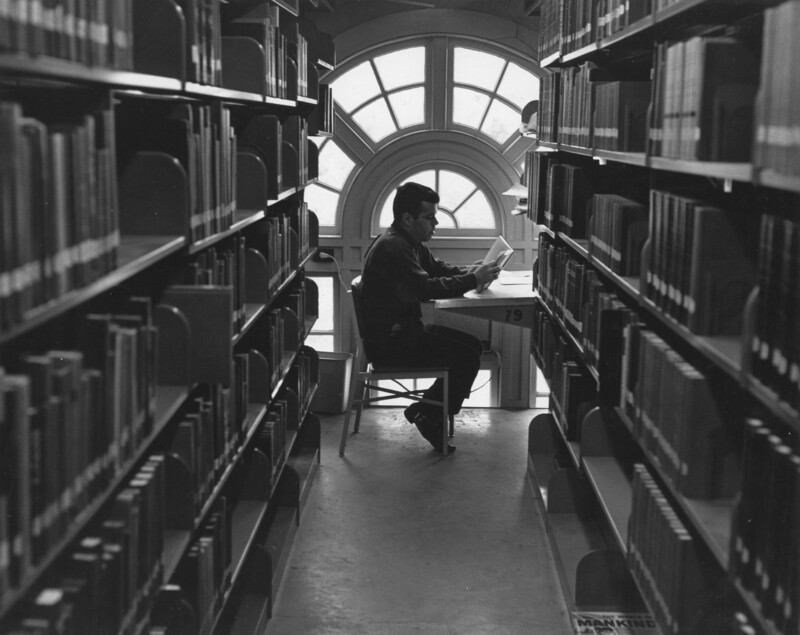 By 1974 the library was open 105 hours a week and had the second highest ratio of books-to-students in North Carolina, only after Duke University (The Annual Report for 1970-1971). 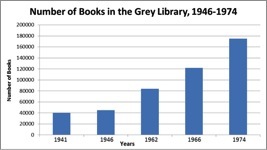 This data exemplifies the growing use of the college library during the Grey era. 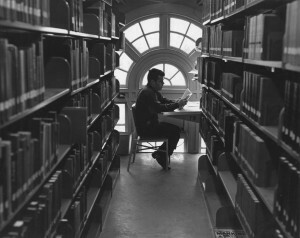 The numerous uses and expansive collection of books provided to Davidson College students at Grey Library required an established list of rules and regulations. The Hugh A. and Jane Parks Grey Library Handbook, written in 1967, notes that books could be checked out for two weeks at a time (Manual). If this policy was not followed, however, students were required to pay a five-cent fine every day and often had to meet with the Dean (Manual). Serious cases required a phone call home from the administration (Manual). In addition to implementing fines, Grey Library prohibited tailing outside of designated areas, hiding books from others, or “mutilat[ing]” library materials (Manual). With the assistance of these rules, the library and its staff worked to create a rich collection and ideal environment conducive to student work and leisure. After the library moved out of the building in 1974, Grey followed the path of Carnegie Library and became the new student Union. (Sloan Music Center, Davidson Encyclopedia). 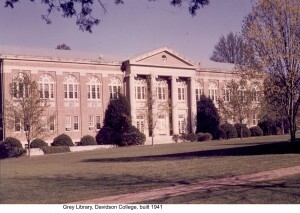 In 2002, the Grey building became the Sloan Music Center (Sloan Music Center, Davidson Encyclopedia). This facility houses the College Music Library, which has allowed the building to return to its original roots. For more information, visit this link on the building as it stands today.